I have a collection of doilies that have been collecting dust, so I pulled one out and made a card with it. The big flower is a stamp from Hero Arts that I stamped 3 times, then fussy cut the pieces out and layered them with dimensionals to make it pop. I curled the petals on the top flower with a knitting needle to make it more life-like. They were stamped with Versafine and heat-embossed with silver ep first, then colored with Copics. The center is dotted with silver Stickles. The swirl is a Cheery Lynn flourish, and the leaves (also silver embossed) were included with the flower in the unmarked stamp set. I found a piece of silver embossed cardstock in my stash and split it in half for the 2 vertical panels, then used a pre-printed (unknown) sentiment found in my doo-dad box. For the final touch, I added some Nuvo glitter drops randomly. The card base is turquoise while the greenery is old olive. Here's a close up so you can see the Nuvo glitter drops a bit better. My card today is based on this Tuesday Morning Sketch #407, so I'll be sharing it over there. Thanks for the visit today - may your Wednesday be just perfect! A Beautiful card, I'll have to get my doilies out too LOL. Love the flower,the colours, the layers and dies. Beautiful. 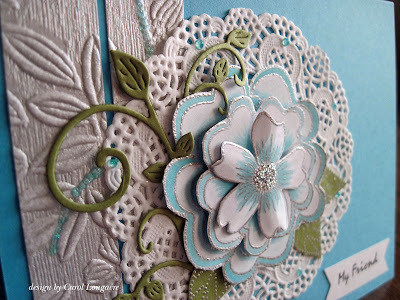 A beautiful card , The flower and colours are so pretty, and all the lovely elements work together so well. Carol, this is absolutely gorgeous. I love the beautiful flower and the doily. Great job. This is one gorgeous card, Carol. The silver edging on the stamps sends it over the top! The doily made a perfect back drop for this amazing flower. 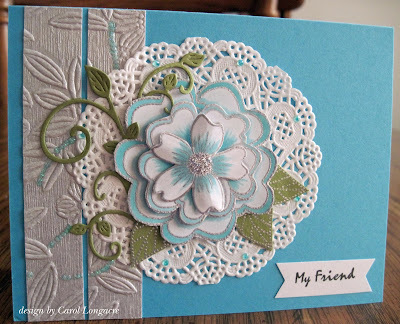 Wow, this turquoise card is so darling! Love how your handmade dimensional flower matches with that sweet doily! And LOVE so much the detail of the silver embossed cardstock cut in half!! The glitter little drops are just perfect to compliment the heat embossed outline of the flower and the stickles in the center! Wonderful effect! Absolutely gorgeous!! 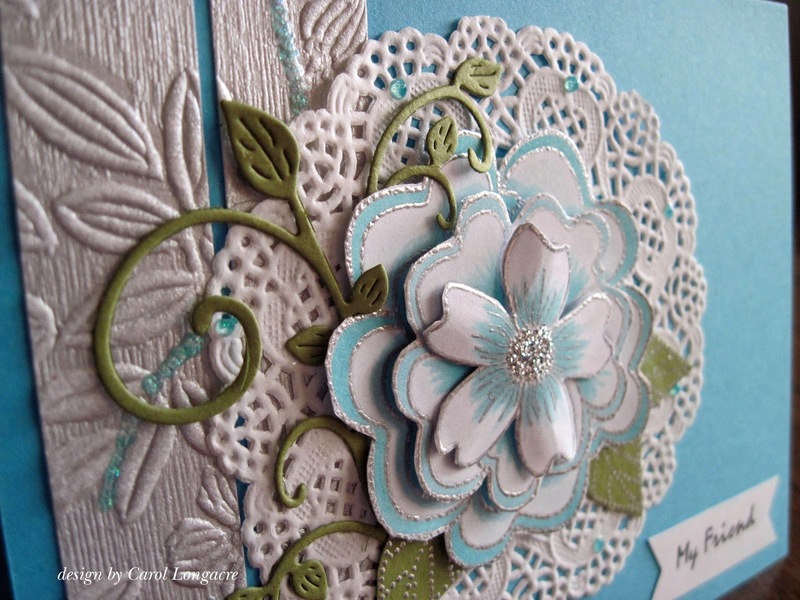 I love your flower, the doily, and the embossing!! Absolutely beautiful Carol! This is the perfect sketch to use a doily on. Love the touches of silver. 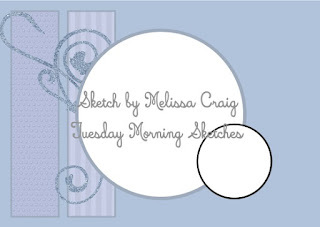 Glad you could join us again this week at Tuesday Morning Sketches. Wow! This is stunning. 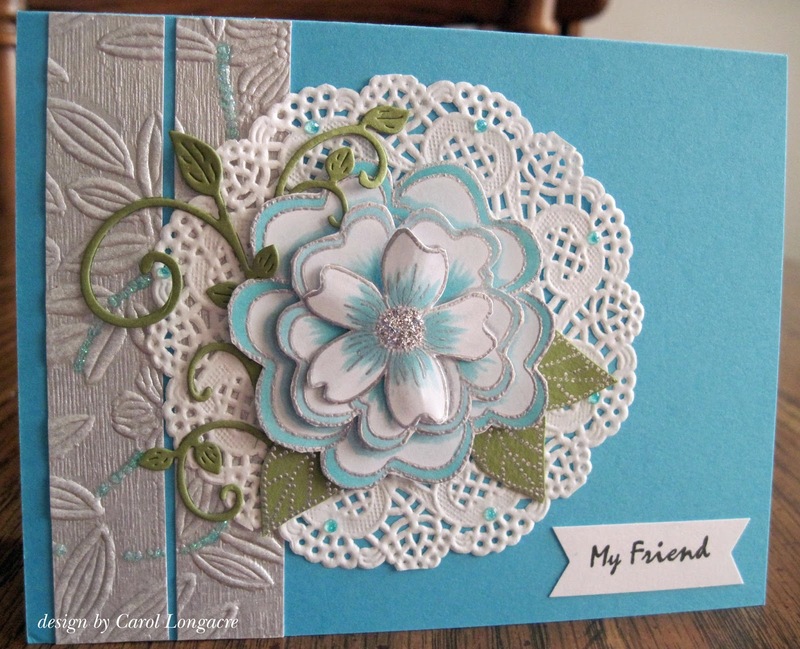 I'm glad you dusted off the doily and used it on your card - it's a perfect compliment for this beautiful flower. Thank you for joining us at Tuesday Morning Sketches. Beautiful, beautiful card. I so like the colors and the lovely flower. Thank you so much for sharing your wonderful card with us this week at Tuesday Morning Sketches. This is lovely! There is so much to admire about this card. I love the layers and how the petals are curved. It adds such a lifelike-ness to your card.